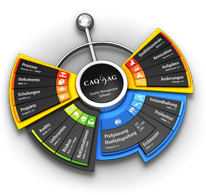 CAQ AG will be hosting its Quality Excellence Symposium exclusively for its customers at the Land & Golf Hotel Stromberg on September 14. This event allows you to learn more about the successful deployment and application of CAQ.Net in the everyday working environment from fellow users and how our latest innovations can benefit you. The event and all presentations will be held in German. Clear communication, trust, and fairness are the cornerstones of our company philosophy and business conduct. Hence, the fundamental principle behind the Quality Excellence Symposium is the mutual exchange of knowledge and experience between our users and us. Apart from introducing the latest innovations and conveying the latest news from within the world of CAQ.Net® and quality management in general, the event therefore primarily serves as a forum where our users can discuss CAQ and quality-related topics with one another and us. Friday’s programme holds a lot in stock for everyone interested in cutting edge quality management solutions. Several CAQ-users will be delivering presentations regarding the usage of CAQ.Net® in their respective companies and the latest functions and modules of CAQ.Net® will be introduced. The symposium will conclude with an outlook for the upcoming year and a discussion of what innovations in CAQ.Net® are planned in the near future. The attendance fee for the Quality Excellence Symposium including overnight stay at the hotel is 250 EUR. Please note that we only have a limited contingency of hotel rooms available at this special rate and that they will be allocated on a first-come, first-served basis with regard to the point in time that we receive your registration. The attendance fee for the Quality Excellence Symposium without overnight stay at the hotel is 125 EUR. Participation in the soiree on Thursday evening is already included in both options. This year’s symposium will begin with a soiree on the evening of Thursday, September 13. After a short reception at the hotel there will be a golf taster session on the hotel’s own 18 hole golf course. This will be followed by a buffet dinner and the evening will eventually come to a convivial close at the hotel bar. The 4-star hotel Land & Golf Hotel Stromberg is located near the town of Stromberg in the district of Bad Kreuznach, in Rhineland-Palatinate, Germany. It is situated on the eastern edge of the Hunsrück, approximately 10 km west of Bingen. Spend a day focussed on nothing else but your individual quality management system and learning how we can help improve it. We look forward to welcoming you to the Quality Excellence Symposium at the Land & Golf Hotel Stromberg and are confident, that your participation will be more than worthwhile for you. Please note: The event and all presentations will be held in German and registration is only possible via the German language site.